Lavender Cottage can be found on Eastgate, a tree-lined street just a short stroll from the centre of Pickering. It has 2 bedrooms and is fully equipped for self-catering guests, providing a real home from home for visitors to this beautiful part of the country. Whether you're looking to explore the stunning Yorkshire Moors or visit the coastal towns of Whitby, Scarborough or Filey - Lavender is the perfect base and offers a warm welcome from your travels. Alternatively, just want to get away from it all and take things at a slower pace, then bring your favourite box sets and settle in. If you don't want to cook, there are restaurants and pubs on your doorstep or you can make use of the fully equipped kitchen and sit down in the dining room to relax over dinner. Please note that during peak season, mid July to the end of August, our changeover day is a Friday. We are happy to accept, wherever possible, short bookings at any other times of the year. We fell in love with Pickering on our first visit and have returned so often that we felt like we were already living here. After spending many a weekend or longer when we could manage it, we finally decided to relocate and now live about 15 minutes from Pickering. We still love visiting Lavender but now that we are not booking it ourselves, we would like to encourage more people to visit this lovely part of the country. We have tried to provide a real home from home in the cottage and we have received lovely reviews from all of our guests. They have also provided a book of comments, recommending places to visit or sharing the highlight of their trips - please do come and stay and add your experiences - Yorkshire is definitely for sharing! We first came to Pickering a few years ago and stayed at the White Swan after a hectic Christmas and New year. We sat at the table in the window with the fire blazing and the coffee steaming, watching the snow settle outside and we were hooked! We have been coming back to this area year on year and we fell in love with Lavender cottage the minute we walked in and we hope that you will too.We love to wander round the Castle or the many Antique shops and a visit to the Flea Market is a must! Soak up the atmosphere over tea and cake in one of the many tea shops and just watch the world go by. If it's a special occasion, why not book dinner or afternoon tea on the Steam Train to Whitby or dine in the White Swan. The cottage has many original features (stone walls, beamed ceilings) and has been renovated to a high standard. We love spending time in the cottage and after a hectic week at work, there is nothing more welcoming than a bottle of wine in front of the cosy fire during the colder months or sat under the gazebo in the summer. You can escape the madness for a few days and enjoy the warm and friendly welcome that Pickering offers. The cottage is perfectly situated for restaurants and pubs. The deli provides freshly cooked meals which can be re-heated and enjoyed in the comforts of the cottage and the black pudding sausage rolls and scotch eggs must be tried ! A luxurious and spacious downstairs bathroom with large bath and shower, basin and toilet. Lovely cosy room with plenty of seating on leather sofa , armchair and Poang (rocker chair) around a stone fireplace with stove effect gas fire. Flat screen TV/DVD with Freeview, Blu-Ray DVD and I-pod dock/speakers. Some Board games, books and DVDs. Fully-equipped kitchen with gas cooker/hob, microwave, nespresso coffee machine. Notes on accommodation: We offer a home from home experience at Lavender cottage in a stunning part of the Country. You will find everything you need for a relaxing and enjoyable holiday with all the comforts of home. You can explore the lovely market town of Pickering with a market every Monday or explore a little further to the coastal towns of Scarborough, Filey, Whitby, Bridlington and Robin Hood's Bay. York is on your doorstep and so whether you are looking for culture or shopping - you are sure to find it. Children are welcome. We do have a small fishpond and so young children may need supervising but we have made every effort to make the the garden as safe as possible (it is fully enclosed). You can dine al-fresco under the solar-lit gazebo after a day's activities and plan your next day's adventures. Small dogs are also welcome (with prior agreement). We hope that we have thought of everything but if you have any queries, then please let us know and we will do our best to help. Outside: Lavender Cottage has a lovely enclosed lawned garden with shrubs and paved patio area. The gazebo is perfect for long summer evenings and you can enjoy breakfast on the patio area each morning. There is parking on the road opposite the cottage. Utility Room: Washing machine and dishwasher. Cleaning / Towels / Linen / Maid service: Towels and linen are provided (except cot linen). Highchair is available and travel cot can be provided on request. Other: Dining room with dining table and 4 chairs. The cottage is lovely. Clean, warm and works really well for our war weekend. Everything we need, from cooking to ironing. Really central to Pickering and any bus stop to go further afield. Its our favourite. Walking distance of steam locomotives - perfect! The cottage is well placed and comfortable. Parking on the road might seem a menace but it all worked really well - with care just needed when unpacking/packing up and frequent crossing required. To be within walking distance of the attractive town, the steam railway, walks around the castle etc never mind the CoOp, was a real positive. The town is charming and to be so near to facilities made for a very relaxing time. Malton is only a few miles away, with trains to York and on to Durham, and Goathland and the North York Moors are easily reached by car too. So, a charming cottage in a good spot. Low ceilings just need to be remembered. The lighting, flooring, bedding are all positives. The garden is nicely enclosed and dog friendly. A warm and welcoming property. Really good base for exploring North Yorkshire, we didn't spend a lot of time in the cottage as we were out and about. The property is indeed centrally located in Pickering and we could have eaten out every night at a different restaurant or indeed cooked in every night. 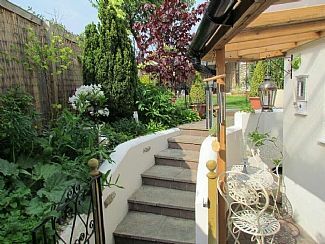 The house is quirky and perfect for 4 people with a lovely garden which is enclosed and perfect for dogs. The parking is on the road but was never a problem - only once when we returned during the day did we have to park more than 50m from the house. The bedrooms are both doubles with one slightly bigger than the other. There is a nice TV with speakers and somewhere to play DVDs - overall we had a perfect time and visited everywhere from Whitby to Scarborough, Helmsley to Malton. All are within 45 mins - many closer. The GNYR steam railway is perfectly located and the area is also perfect for cyclists. The house has a covered area where bikes can be kept in the garden; they were perfectly safe there. Thank you for a wonderful stay. Beautiful cottage..perfect for us and our dogs. The cottage is well located for Pickering and parking was never a problem. Downstairs is quite spacious and pretty comfortable. Everywhere is nicely decorated too. The kitchen is large with the slightly odd arrangement of having to go outside to a back utility area for the dishwasher and washing machine. The garden is very nice, a great place to sit out with a drink in the sun. However, one of the most important elements in any hotel or self catering accommodation is the quality of the bed. The master bedroom mattress simply wasn't up to the standard we expect of a 4 star cottage. It's a king sized continuously sprung mattress which is very springy and every time one of you moves the other person can feel it. I would expected at least a good quality pocket sprung mattress or maybe a hybrid memory foam/pocket sprung. As a result we did not sleep well. The second bedroom is ok but there is absolutely no usable storage space, there is just one wardrobe in the main bedroom. Also cleanliness, we'd expect the place to be immaculate (we have a number of 4 star holiday rentals ourselves so know what's expected). There were several cobwebs, the rim around the bath between the panel and bath was dirty, one of our towels was dirty and the dish drainer needs replacing. The grouting in the bathroom also needs cleaning/replacing. Also the tie backs in the main bedroom were literally falling out of the wall. Given that there are much better places we've stayed in locally, we won't be returning. Thank you very much for your feedback. We have never responded to a review before because up to now, they have always been positive. This is our first review with negative comments in 5 years, so we take its contents extremely seriously. Firstly, the 4 star rating is awarded to us by Visit England and the cottage has to pass stringent tests. This includes the quality of the mattress. We are shocked at the comments regarding the cleanliness as we consistently score highly in this area. On our last annual inspection, we received 95% for the quality of the cleaning. We have also carried out our own inspections since the comments and have found no further issues. The dirty towel is unacceptable, but if we had been told, we would have changed it immediately. We’ve looked into how it happened, as a it has never happened before, but it remains a mystery and one that will never be repeated. We are unsure how to respond to the comment regarding no storage in the second bedroom, as there is a wardrobe with a storage draw in the room. Finally, Lavender cottage is our only holiday let and not a business, but somewhere we love to escape to. It is full of our own personal belongings and most of the feedback is that Lavender is a real home from home. In light of your comments we have monitored reviews since your visit and all comments have been positive. Thanks again for your feedback and we’re very sorry we won’t be seeing you again. 30 minutes drive to Scarborough. Filey, Whitby and Robin Hoods Bay are a little further but well worth the visit. 30 minute drive from York and many visitor attractions. The Railway Station at Pickering is the base for the North Yorkshire Moors Steam Railway and travels to Whitby, Goathland, Grosmont. The Great Dalby Forest is only 5 miles away and Flamingo Land only 4 miles away. York is around 30 minutes away and the McArthur Glen Designer Outlet Village is on your way! You are within easy reach of the North Yorkshire Moors National Park and there are lots of small market towns or coastal villages. You will find a local supermarket, pubs, restaurants and many interesting shops in Pickering and make sure you visit the Market if you're here on a Monday.